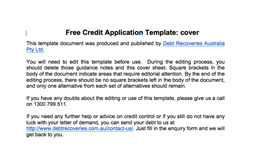 Credit Application and Terms Template- Use the credit application form if you are extending any sort of credit terms to your customers. 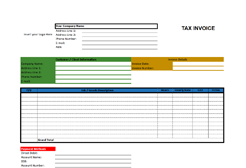 Tax Invoice Template- The template provided meets the Australian Taxation Office requirements for the details that must appear on an invoice. 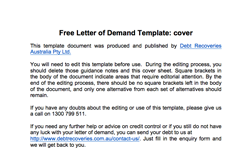 Letter of Demand Template- It’s basically a Final Demand, so we are assuming you have already sent your own follow up letter/email. Can’t be bothered? Send to Us! If all this fails or if you prefer a professional to handle it, outsource immediately to us here at Debt Recoveries Australia. Outsourcing credit control can often be much cheaper than hiring your own staff. Simple and easy. Call us today 1300 799 511. The template provided meets the Australian Taxation Office requirements for the details that must appear on an invoice. It’s basically a Final Demand, so we are assuming you have already sent your own follow up letter/email. Use the credit application form if you are extending any sort of credit terms to your customers.